I planted Candy Onions three weeks ago. They have taken root and started to grow new leaves, but the new leaf is brown on the tip (1 inch). We had 1 1/2 inches of rain the day after planting, then it was dry for two weeks, and then again two more rains about 3/8 of an inch each. I applied 23-0-0 fertilizer three days ago and then watered (overhead) just enough to desolve the fertilizer. I did not notice brown tips when watering. It sounds like you burned the plant with the nitrogen fertilizer. Next time, water the plants well before applying nitrogen fertilizer. 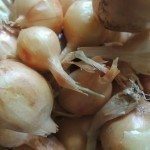 For what is it worth, you do not want to use only nitrogen on your onions. This will produce big tops but small bulbs. Instead, make sure they are getting a good amount of phosphorous.